As the season approaches for Carpet Beetles, we have gathered up some interesting information on these pests, how to identify and how to prevent them. Carpet beetles can usually be found in furniture, carpets, wood and basically anything that they can chew. Its larva, which have a similar appearance to a caterpillar, feed on anything from feces to dead skin cells. They can also be mistaken for bed bugs. 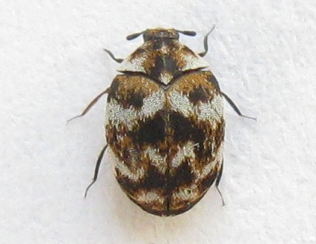 Varied Carpet Beetle – they are small and round with a brown/black and white opaque shell. 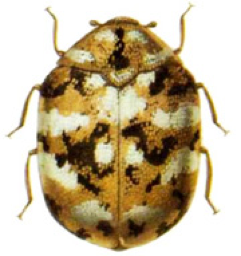 Furniture Carpet Beetle – they are also round with a mottled yellowish carapace. 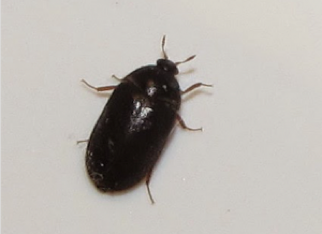 Black Carpet Beetle – long with a shiny black shell. Make sure to vacuum all carpeted areas and wash all fabrics. Check under rugs, furniture and wooden objects. Wash fabrics in hot soapy water to kill the beetle, larvae and eggs. If possible, hire a professional vacuum cleaner. Most professional steam cleaners are designed to get rid of bug infestations on carpets. Use boric acid on carpets and fabrics. However, this acid is a bleaching agent so if you do use this, be sure to spray lightly and vacuum within 2 hours to remove. Buy a spray such as Gentrol, this is a powder that can be used to protect from an infestation.